Christmas cards are not easy for me … as my age (and humbuggery) has increased, I’ve found myself increasingly irritated by their seemingly infinite stylistic choices, cost, and, most of all, their need to be stamped-addressed-mailed. No, e-cards are not an option. Instead, I’m offering online vintage holiday postcards! Regular Christmas cards tend to have cheery, idealized scenes on their faces and these cards do as well. But, instead of prancing reindeer, Grandmother’s snowbound cottage or trumpeting angels, these feature desert landscapes bristling with cheery, idealized depictions of cacti and succulents. Click on the card above once, then again, and you’ll be treated to the charm that age imparts to card stock, lending it a warm patina. Enjoy the inimitable color intensity of mass production printing; relish the visual texture provided by a universe of tiny dots interacting perfectly, while still ever-so-slightly “off”. Such postcards were printed as souvenirs to be sent to those back-home, to amaze them with the vegetation’s unfamiliar shapes and thorny surfaces. The plants shown on this first card are rendered well mostly, if with a certain naiveté I find endearing. The look, overall, feels like a class portrait, with each plant looking its best and posed just-so, helpful nameplate in tow. In other words: The good kids. Now, unlike the first postcard, this older version is cruder, more naive and somehow funnier. If the plants on the first card were the good kids, these are the problem children who won’t take their places; they’re spaced unevenly and wildly over- or under-sized. And, unlike the artist who created the first scene, this one doesn’t seem to have benefited from the proper reference materials: the rainbow, barrel and pincushion cactus bear no resemblance to their actual looks and are in dire need of a shave! Still, I love this card, clunky IDs and all … click on it once, then again, and you’ll see its rough linen-textured surface and how it contributes to its slightly blurred, desert dream look. 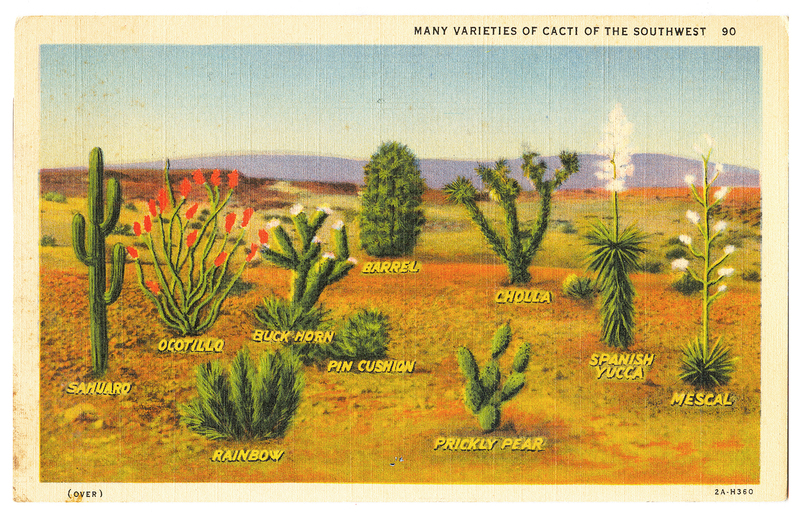 Will old desert souvenir postcards replace traditional Christmas cards? Not a chance … but they are a fun alternative that suit me just fine. These both came to me via eBay, from different sellers, for about 99¢, minus shipping! Happy holidays to each of my readers from Paul, myself, and Frito and Inky! Posts have been few of late as I’m still struggling to get over my recent illness, but more are on the way … see you soon! Happy Holidays! And thank you for all your wonderful , fun, and informative posts throughout the year. Thanks much, Carol. Hope you have a wonderful holiday, too! I love this! I feel the same way about traditional holiday customs – you might want to check out the wreath on my website! That wreath is awesome, Susan. I love its twisty good looks … and I have to admit my heart leapt when it first appeared on my laptop screen: I thought it was rusted steel! Gorgeous. I’ve got that first one in my collection and wish I had the second. That makes two of us, Loree, I’ve been coughing so much and so strenuously I might self-induce abs! Thanks for your good wishes and email me your address (reubix1@yahoo.com) I’m sending you the second card … you know, fer Xmas! If cholla actually were the size of saguaros we would all be in great danger. What? You wouldn’t want to wear kevlar-everything, Donita?? Thanks for commenting, Lenora … Have a great holiday! I was so pleased to find a new entry. Meant you were feeling some better…Paul? And I too agree about the card thing.. But leave it to you to come up with a wonderful change..
You two keep recovering. I hope your holidays are blessed.and that the New Year brings to you all your wishes. Hope you and yours had a Merry Christmas, etc! I also hope you guys are feeling better. Love the post! Yes! Feeling much improved … hope you and the hub had a great day! … and guess what? : I sold the rest of the backyard stuff … emptiness is imminent! Right on! Can’t wait to see what you do to the place! Yassssss… but now I want to ditch all the terra-cotta pots in the front as well; it’s gettin’ good now! I might take some of those pots off your hands, if you want to talk. Been thinking about zazzing up my front porch. Cool, watch for my post tomorrow or the next day … the terra cotta’s going up on the block! Love’em. The Sonoran is practically my backyard here in Phoenix. Nice prints. 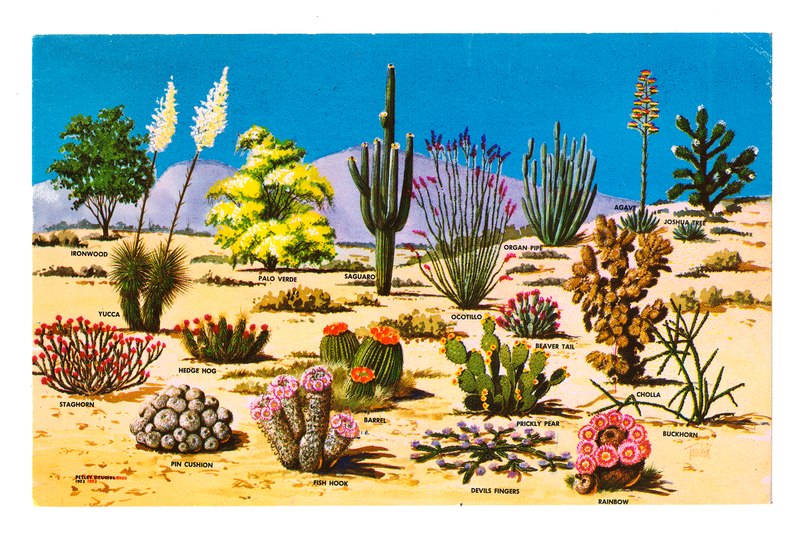 My current eBay obsession: vintage succulent/cactus postcards.